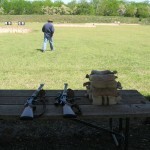 Spent some time at the range this last weekend testing some new reloads for the rifles. Pretty much settled on the bullet and powder for the 30-30. Still working on the bullet for the 45-70 and not real sure about the powder yet either. On the 30-30, I’ve settled on 3031 for the powder. I didn’t see too much difference with H4895 that I compared it to. The Speer Hot-Cor bullet I used performed tremendously. Now I have to just find more of them! They’ve been out for months. I just want to tweak the charge a bit first and see if I can squeek a bit more performance out of it. On the 45-70, I’m down to H4895 or black powder, just depends on the round I settle on. More range time needed there (and who can complain about that?). I recently put an Wild West Trigger Kit on it and man, what a difference that made. 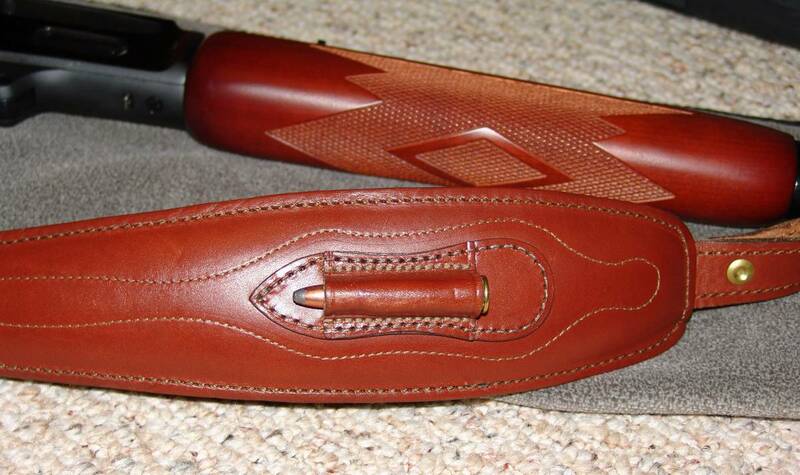 The rifle had a strong trigger before, now it’s down to about 3-3 1/2 pound pull. Beautiful. Best $90 bucks I’ve spent on that Marlin. I must admit that I was a bit disappointed in the rifle, but that new trigger has made all the difference in it. I can’t recommend it enough. I also played around with my wife’s crossbow, trying to learn how they work. I know next to nothing about archery. I’m fairly certain that the string needs replaced. I just don’t think it’s getting the performance it should be getting, so I’m guessing the string and cables are probably shot. That’s my guess. I’ll have to take it down to the local archery shop and see what they say. So that’s the report, great couple of hours at the range. One of the best ways to spend a Sunday afternoon in my opinion. I’ll have to admit, I’m not really that much into the tactical gun scene. I prefer wood and metal and revolvers. 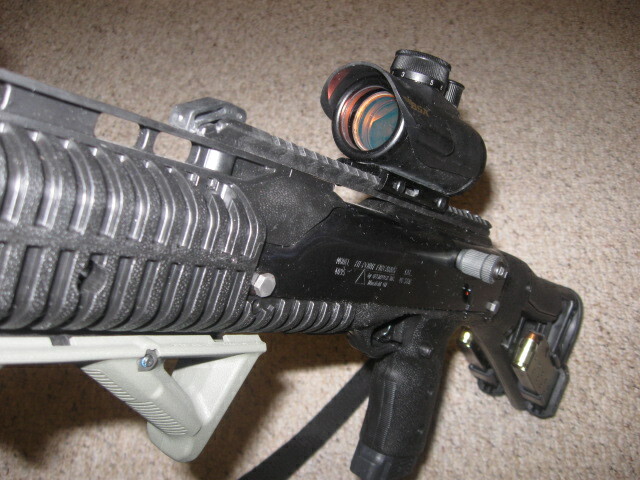 I’ve never really been attracted to AR’s with all the gadgets and doodads stuck all over the things. Give me iron sights and some nice looking wood. Now I do have a Glock and it is fun to shoot, but I’m still drawn to my Smith & Wesson model 10 revolver. 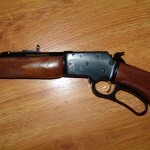 Which brings me to the topic of the day – my recent purchase that has been dubbed “the zombie gun” (I’ll explain later). 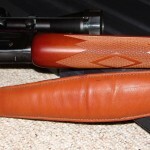 I first heard of these pistol round carbines while perusing one of the firearms forums that I frequent. Reading through the various threads and hearing the guys talk about how much fun they were, I was intrigued. Especially when I found out how inexpensive they were. Plus, some guy even took a wild hog with one! How cool is that? 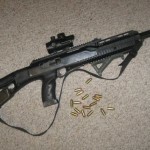 So here it is, my Hi-Point 4095 carbine in 40 S&W. And yes, I’ve put some gadgets and doodads on it. The thing is so economical that you actually have money left over to put gadgets on it, so why not? 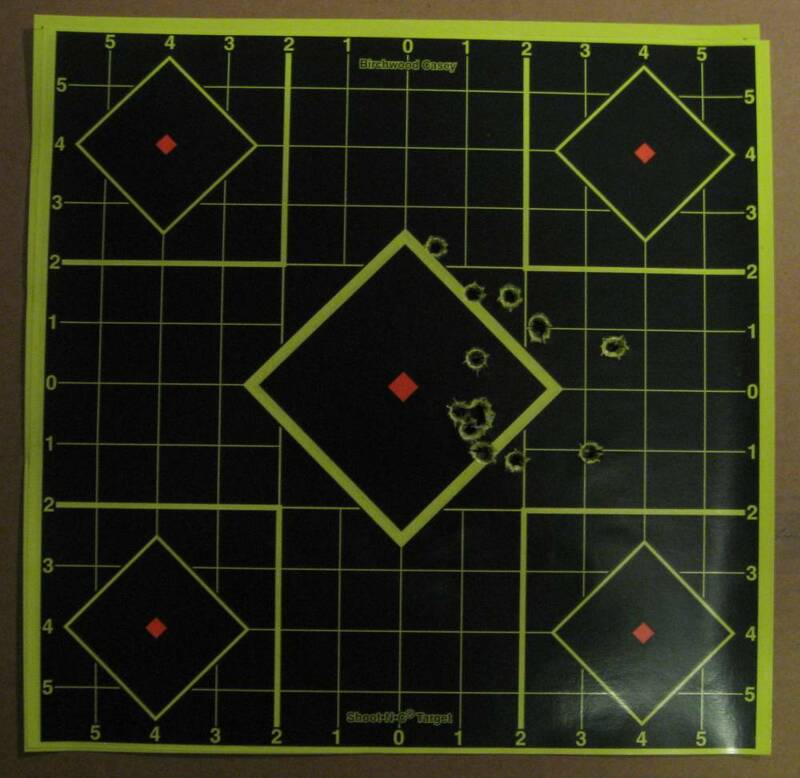 I haven’t had a chance to finish siting in the red dot yet, but my first impression of the rifle is great. It shoots great and feels great. The trigger is very nice, much nicer than I expected it to be. It pulls up well into the shoulder. Hi-Point has blown me away with this gun. I can see why everyone loves the heck out of it. OK, so let me get into why I call it the Zombie Gun. I love me a good zombie movie (and not all of them are) and one day I ran across some articles where gun owners were discussing which gun would be the best gun to have when the zombies show up. Alright, cool. But Keith and I talked one day and decided we’d write a zombie gun article some day also. But our spin would not be which gun we wish we had, but what would we grab from what we own to take on the hordes of the undead. 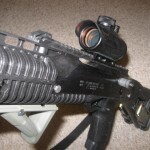 So here’s my article and why this would be my zombie gun (and hence why it has that nickname now). So I thought of the firearms I have and which would be better. Of course, the plains rifle is out. 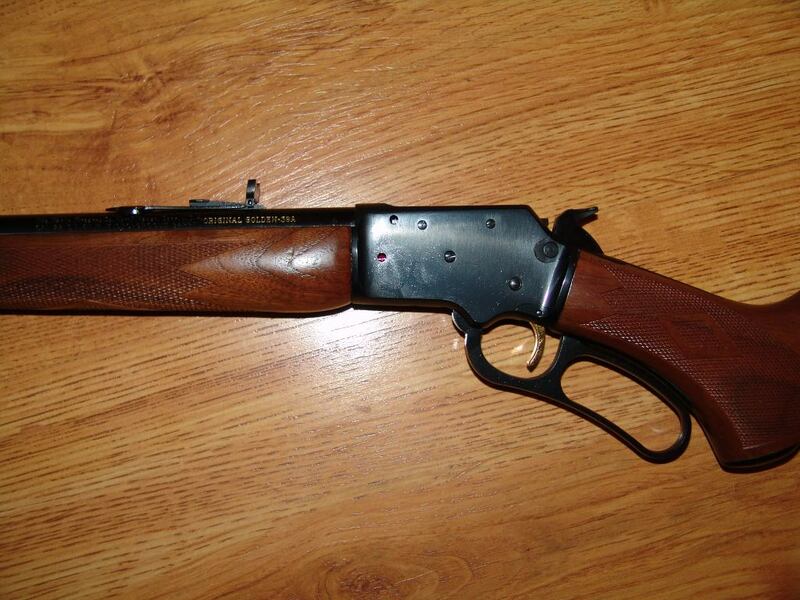 A muzzle loader is just going to get your brains feasted on. So its out by default. The shotgun would be good for close range, but not much help long distance wise. Plus carrying enough ammo would be heavy. The pistols, as well, only good for close range. One of them would be the backup. So that left the Marlins. I’d probably pass the scoped one by as it would just be too cumbersome. No help in close range and too easy to knock out of alignment. You know, you’re running and moving a lot, staying ahead of the undead. 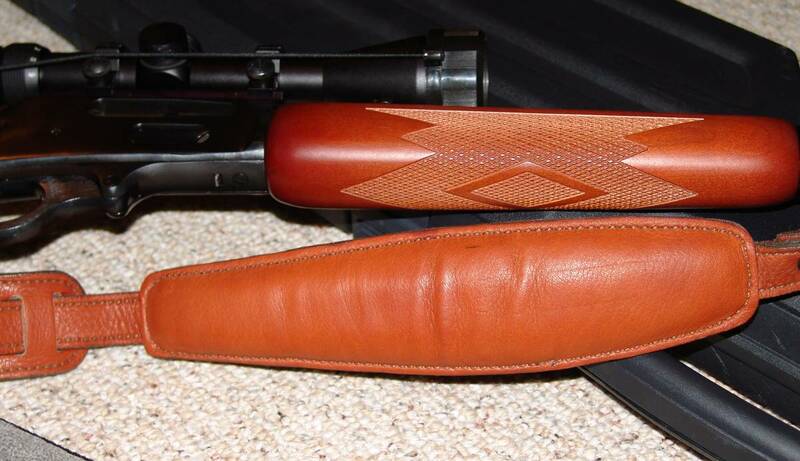 So that leaves a Marlin 336 in 30-30 with iron sights and the new carbine. Both are light and maneuverable. Both would be good at distances of around 100 yards, although the Marlin would have an edge here as it could poke out further than that. And both would be handy up close. The Hi-Point has an edge in ammo count though. 10 in the mag and 1 in the chamber for the Hi-Point. 6 +1 for the Marlin. With the Hi-Point I can reload with a new magazine. 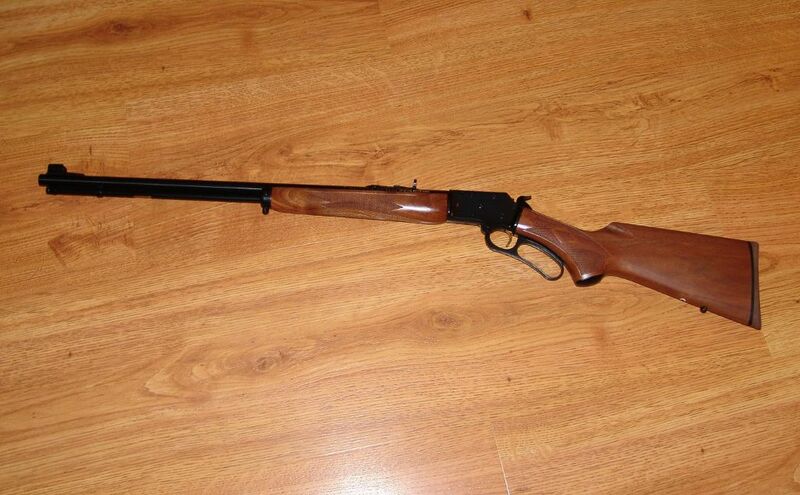 The Marlin I’d have to load individually. So you have to take into account which one would be easier to reload on the move. 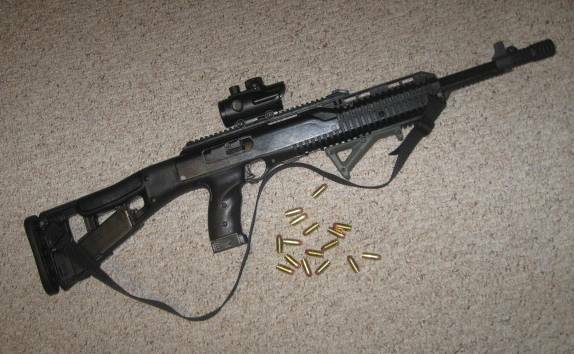 The hi-Point would have the edge here – that is as long as you have enough mags. So it might end up being a wash in the end. 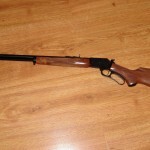 Ammo for both guns should be readily available and easy to find as both are popular calibers. But there’s one place where the Hi-Point wins. It shares the same ammo as my Glock. So I only have to carry one caliber. 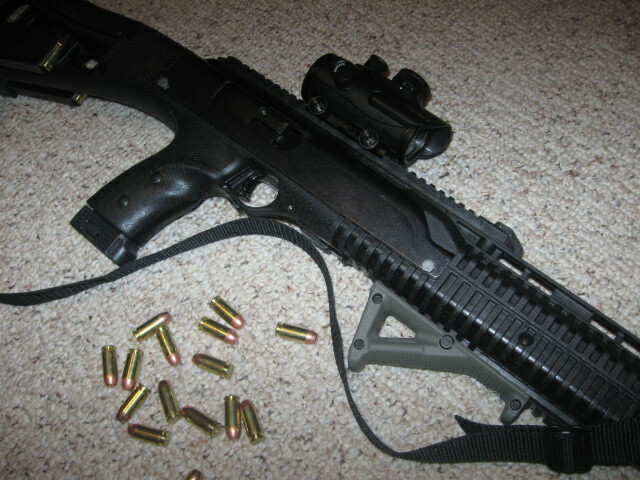 What would totally seal the deal is if the carbine and the Glock shared the same magazine, but that isn’t the case. I suppose one could say I’d have less chance of jams with the Marlin and the S&W revolver. And that is true, less of a chance for jams. 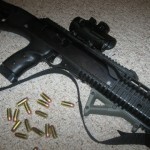 But from what I’m reading, the Hi-Point seems to be a workhorse and can take a lot of abuse. The one unknown is how long any of the guns would shoot when getting really dirty. And most likely, the guns are going to take some serious abuse between cleanings. Think about, lots of running, lots of moving around and staying mobile. There might not be much time to clean the guns. 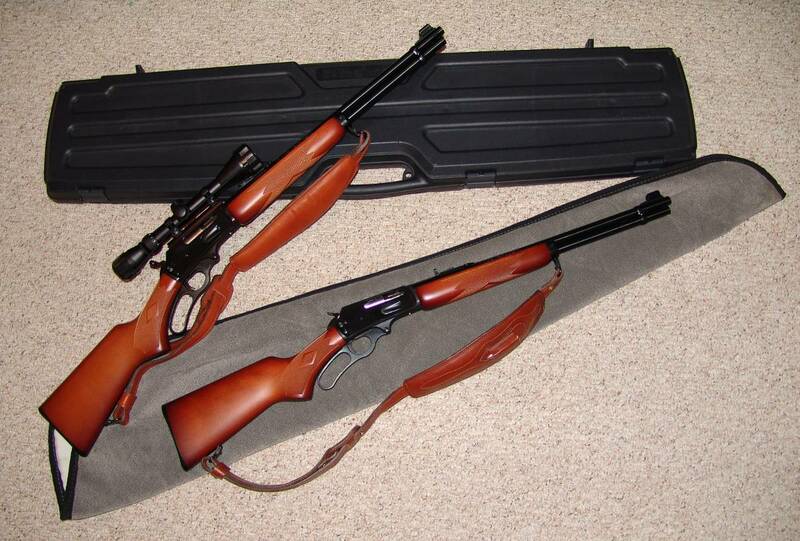 I really wanted the Marlin and the S&W revolver to win. I really did. It would be to cool taking out the Zombies with a lever action rifle, wearing a big hat and taking names (do zombies have names at that point?). But in the end, I have to go with the carbine and the Glock as a back up. It would just be easier sharing the same ammo in the long run. So there you go. If the hordes of zombies ever show, I’m ready. I’m curious to see what Keith comes up with on his end. I spent Saturday shooting with my hunting buddy. Both Marlins are shooting great at 50 yards. 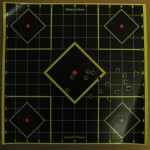 Took some shots with the 50 cal plains rifle (there is only 3 1/2 months until muzzleloading deer season by the way!). And we did a bunch of pistol shooting. I’m planning on taking my conceal carry exam this summer, but I need more practice before taking the class. I don’t get around to shooting my handguns as much as I should. Keith gave me some good tips and I did pretty well. Another couple of times at the range and I think I’ll be ready. I do need to find a class and get signed up for it. I need to do some looking around and find out who teaches it around here. The Marlins are doing great so far. Each time I get them out, I’m more and more impressed. No wonder this rifle has been so popular for so many decades. 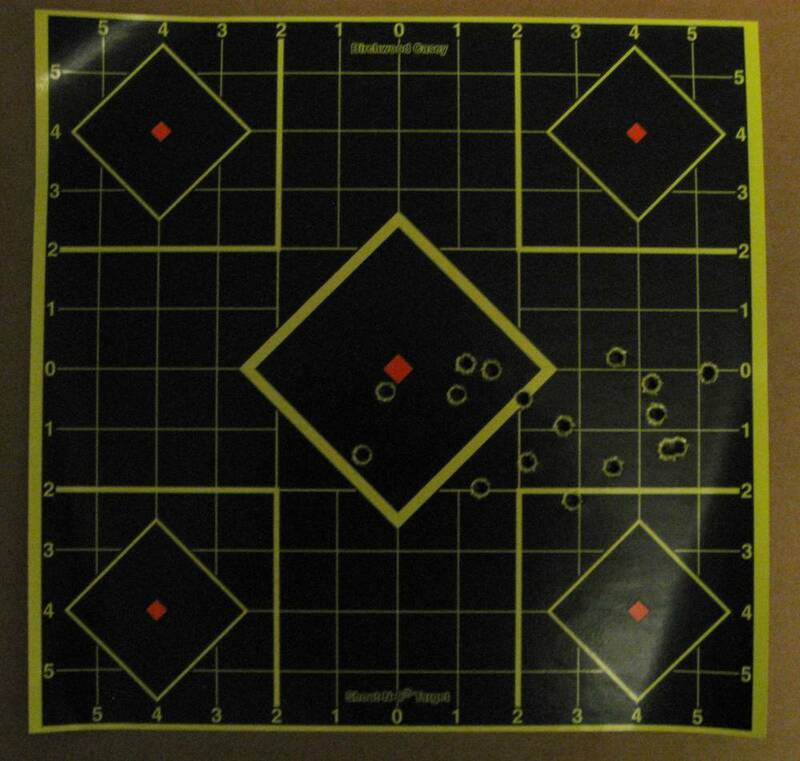 We got the iron sights adjusted for 50 yards. I managed a bullseye at 50 yards with the scoped Marlin. A few more sessions at the range at 100 yards should do the trick for those two rifles. 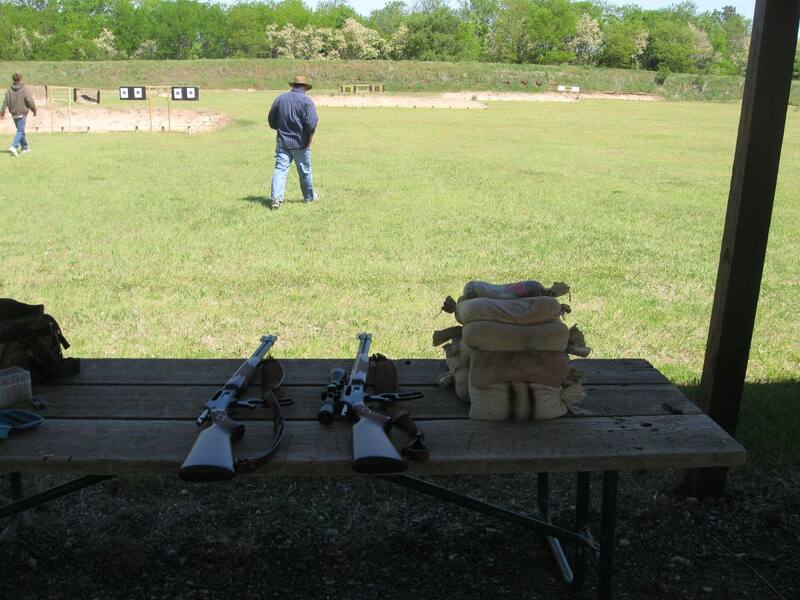 Keith brought out his 30-40 Krag and put a few rounds down range. What a sweet shooting gun that is. First time out with it and it hardly needed adjusting. Smoothest bolt action I’ve ever felt. I also managed to get some shooting done with the Plains Rifle. I was pleased with the results, especially after the disappointing year I had last deer hunting season. I seemed to get a better understanding of the site picture. Now I just need more range time to make sure I’m repeating the results. So, all in all, it was a great day. There’s just nothing better than spending a day shooting with a buddy. I wished I would have remembered a camera. We shot up an old computer of his (sorry Dell!). The Dell logo made a great target circle. And for me, destroying a computer like that just puts my soul at peace. A 50 cal round ball sure puts a nice big hole in the thing! Finally had a chance to get the Marlins to the range last weekend. 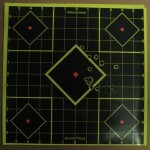 It was my first attempt at sighting in a scoped rifle. We didn’t do to bad. The Good Wife’s shoulder started bothering her after a while so we stopped after we finished up at 50 yards. I guess I need to watch how she’s holding it in her shoulder. We still have some work to do yet, we were pretty close at 50 yards. Still needed to get the windage in before moving out to 100 with the scoped rifle. I have some adjusting to do with the rear site on the other one, didn’t have the time out there. 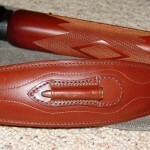 The open sight rifle is shooting to the right. So I need to adjust the rear sight some to compensate. I was shooting Federal and Remington rounds through it. The scoped rifle started out to the right and low also. I don’t have much experience shooting a scoped rifle, so it was all new. Can’t say I disliked it. We only shot the Federal ammo in it this time.